There is something about the combination of poultry and apples that just sings. I have no idea why it works, but it just does. Duck and Apples is one of my go-to dishes in winter, and this dish, essentially pheasant with apples, is called Pheasant Normandy. 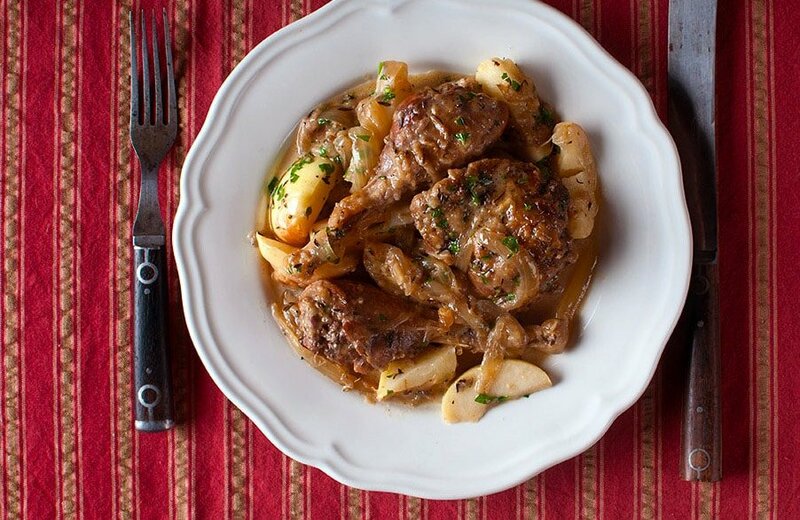 It’s a wild game variation of a French classic done with chicken. I first learned about chicken Normandy while watching Emeril Lagasse, of all things; he made it on his stand-and-stir show a decade or so ago. Been making it ever since. 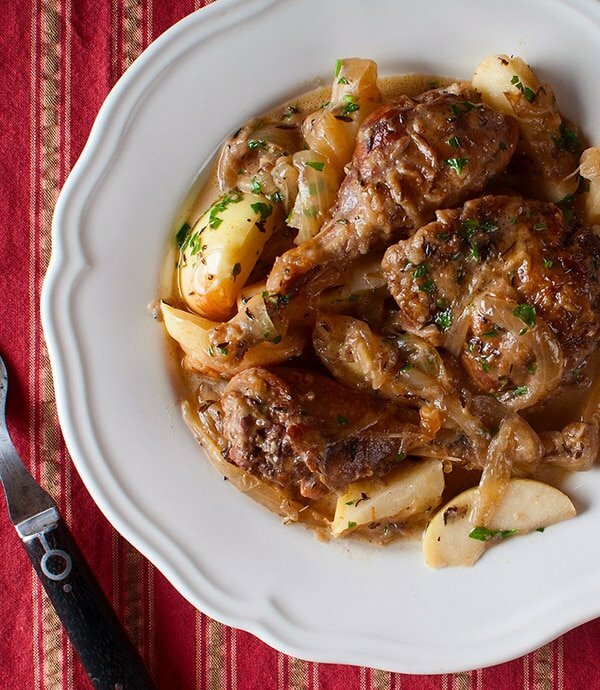 This recipe is a simple mix of sweet onions, gently cooked apples, cider, cream, brandy and chicken… or pheasant in this case. There is no special technique involved here, no great difficulty or esoteric ingredients. This is comfort food, and all it asks of you is a little time. 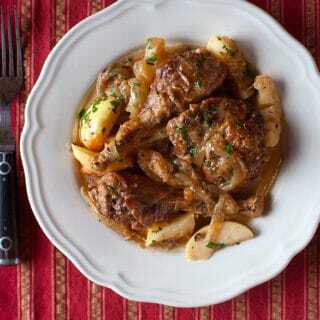 I designed this recipe for skinless pheasant legs, which can be cooked entirely on the stovetop. If you have skin-on legs, you can crisp the skin in at 375°F oven at the end. Obviously this will work with chicken, but it's also great with partridges or ruffed grouse as well. You could also use wild turkey thighs. Salt the pheasant legs and let sit at room temperature for 30 minutes. Heat 2 tablespoons of the butter in a Dutch oven or another large, oven-proof pan over medium heat. Add the apple slices and sauté until they turn a little brown around the edges, turning occasionally. Sprinkle the apple slices with a little salt. Set aside on paper towels. Dust the pheasant in flour and add the remaining 2 tablespoons of butter to the pan. Brown the pheasant for 3 to 5 minutes per side. Remove from pan and set aside. Add the onion and increase the heat to medium-high. Sauté, stirring occasionally, until they just begin to brown, about 5 to 8 minutes. Take the pan off the heat and pour in the brandy. Put the pan back on the heat and, using a wooden spoon, scrape any browned bits off the bottom of the pan. Let the brandy boil until it has reduced by about half. Add the cider and bring it to a boil. Add the thyme. Lay the pheasant legs in the pan, cover and simmer gently until tender, anywhere from 90 minutes to 2 1/2 hours. Fish out the pheasant legs and strip the meat off the bones if you want to. Turn the heat to high, add the apples and boil down the sauce by half. When the sauce gets a little syrupy, turn off the heat and add the cream. Add salt to taste. Serve by spooning some apples and onions on everyone's plate and topping it with the pheasant. I’m a farmer and an avid outdoors man who loves to cook. This is simply the best site ever. Made this today and it was fabulous! Both my little ones mopped up their plates. Amazing flavors! I made this recipe last night and served it with pan fried rosemary potatoes, oven roasted carrots with peas, and a bottle of Albemarle Ciderworks Virginia Hewe’s Crab hard cider. My wife declared it one of the best meals she’s eaten, and who am I to argue? The meal was made even more satisfying by the fact that almost all ingredients were our own. I have fallen in love with this website and all the recipes just leave me feeling sooo hungry. I have a friend whose hunting trip yesterday yielded 7 undressed pheasant for my deep freezer. I am looking to use one whole one skinned and am wondering if I can do this recipe with a whole skinned pheasant if cut into pieces?. Would I need to add breast meat last to the pan? Or should I just roast the bird and make a apple/cider gravy for the side?